Regal Beer serving tray with 13" diameter. "Prince Regal Salutes You" maker marked American Brewing Company, New Orleans - Miami. 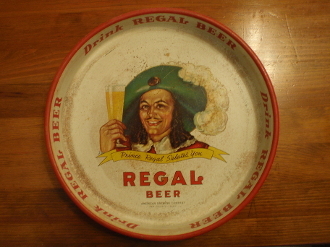 "Drink Regal Beer" written on inside & outer rim. Tray shows wear & rust. Nice tray.